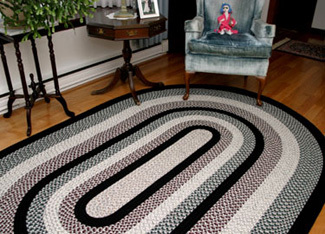 The most common type of braided rug manufactured is of a yarn construction. This means yarn covers a filler core. The filler for these rugs is a blend of natural cotton and synthetic fibers that will not shrink or have dyes bleed to damage your rug or wood floor. The Green Mountain style is made with all new yarn of 60% Polypropylene / 40% Acrylic which will provide years of durable wear at an affordable price. Five beautiful colors are available. These rugs are available in the traditional oval or round shapes along with new attractive octagon and elongated octagon shapes.